JAKARTA, INDONESIA, July 19, 2013 - (ACN Newswire) - As part of the implementation of Garuda Indonesia and Liverpool FC's Global Partnership, and in line with the airline's effort to continuously deliver added value on its services to loyal customers, today, Friday (19/7), PT Garuda Indonesia (Persero) Tbk and Liverpool FC launched the Garuda Frequent Flyer - Liverpool Football Club (GFF-LFC) Edition Card in Jakarta. Garuda Indonesia President and Chief Executive Officer, Emirsyah Satar presented the "GFF-LFC Edition Card" to two Liverpool FC players, Steven Gerrard and Glen Johnson, to symbolically mark the card's launching, as Republic of Indonesia's Minister of State-Owned Enterprises Dahlan Iskan and Chief Commercial Officer Liverpool FC Billy Hogan looked on. - The chance to receive autographed merchandise by an Liverpool FC player. Garuda Indonesia's customers, both existing and new GFF members, who wish to have this limited edition card will be able to apply for the card on the website gff.garuda-indonesia.com or at Garuda Indonesia sales offices, free of charge, during this period: 19 July 2013 - 31 December 2013. President and CEO of Garuda Indonesia Emirsyah Satar said that the launching of the "GFF - LFC Edition Card" is important to both companies as it will surely be beneficial and provide added value to Liverpool FC and Garuda Indonesia's loyal customers as well. "To broaden our market on a global level, especially in this competitive era, it is important for global companies or brands to work together and develop mutually beneficial partnerships," he added. On the other hand, Liverpool FC has over 65 million followers in Indonesia and the card's launching is one of the efforts carried out by Garuda Indonesia to improve service towards its customers who are also Liverpool fans. Meanwhile, Billy Hogan, Chief Commercial Officer at Liverpool FC said "We are delighted to be visiting Indonesia for the first time as part of the Club's 2013 pre-season tour. Our fans gave us the most amazing welcome when we landed and we are thrilled to be partners with Garuda who have helped bring the Club closer to our Indonesian LFC family through various activity. The launch of the GFF - LFC card is another step in connecting with fans to the club through our official airline partner Garuda. Together with our fans and partners we are the world's greatest football family," he said. 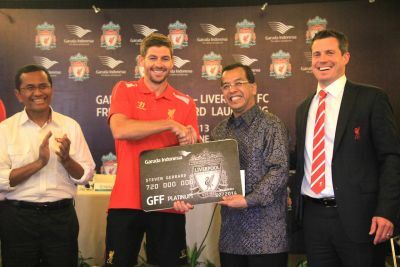 The "GFF - LFC Edition Card" launch is part of the agreement signed in July 2012 between Garuda Indonesia and Liverpool FC, whereby Garuda Indonesia has taken up the role as the club's "Official Global Airline Partner". During their "Pre-Season Tour 2013", Liverpool will fly onboard the special Airbus 330-300 wide body aircraft, which has a seat capacity of 257 passengers, consisting of 42 seats in the executive class and 215 in the economy class. The aircraft also sports a customized logo of Liverpool FC, the famous Liverbird displayed on the the airplane's tail and the slogan "You'll Never Walk Alone", which is synonymous with the team. The A330-300 airplane has carried Liverpool FC's team manager Brendan Rodgers and the club's first team squad, including the likes of their captain Steven Gerrard and new signing Luis Alberto from Liverpool to Jakarta (stopping over in Abu Dhabi), and will continue to transport them onwards to Melbourne (Australia) and Bangkok (Thailand) as part of the "Liverpool FC Pre-Season Tour 2013". During the "Liverpool FC Pre-Season Tour 2013", Liverpool FC will play a pre-season game against Indonesia's national team on Saturday, 20 July 2013 at the Gelora Bung Karno (GBK) Stadium, Jakarta. Garuda Indonesia's partnership with Liverpool FC is also part of the airline's strategy to increase its "brand awareness" in the international market through "marketing communications" program, specifically a "co-brand" program and joint "channel" between Garuda Indonesia and Liverpool FC. As part of the agreement with Liverpool FC, Garuda Indonesia has the opportunity to carry out various marketing campaigns in conjunction with the team. This includes Garuda advertisements on electronic advertising hoardings around the edge of the Anfield pitch during home games, which are broadcasted by top TV networks to international viewers all over the world. In addition, Garuda Indonesia has also been given access to reach over 12 million fans through Liverpool's official Facebook account and 1.7 million of Liverpool's Twitter "followers". On the other hand, the partnership between Garuda Indonesia and Liverpool FC is in line with the airline's transformation and expansion program through "Quantum Leap 2011-2015" and its strategy to become a "Global Player". In February 2013, Garuda Indonesia and Liverpool FC officially opened the "Garuda Indonesia and Liverpool FC Experience", the only co-branding area with Liverpool in the world. Besides offering official Liverpool merchandise, the "Garuda Indonesia and Liverpool FC Experience" area invites Garuda Indonesia customers to experience the unique sensation of being at Liverpool's Anfield Stadium. A photo booth complete with a "make up kit" and "face painting" tools is also available so that customers appear as if they are posing with Liverpool players and lovely Garuda attendants as die-hard Liverpool fans.